A mountain lion named P-22 is making headlines today for being discovered inside—and eventually escaping from—a Los Angeles basement. In this excerpt from his new book about the urban wilderness, Tristan Donovan gives us the origin story of P-22. 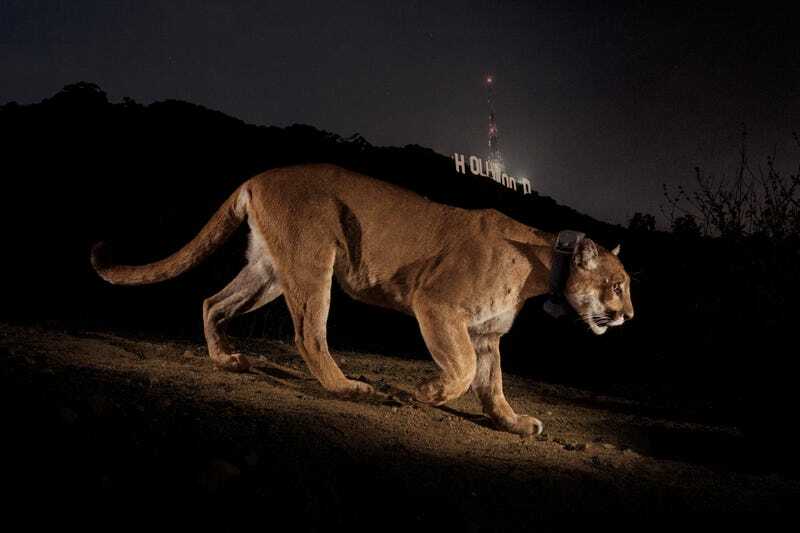 The discovery of P-22, the mountain lion that lives in Griffith Park, was pure fluke. The park is part of the Santa Monica Mountains, but thanks to the Los Angeles sprawl it is cut off from the rest of the range by the Hollywood Freeway and urban development. Griffith Park’s unusual status as an island of natural habitat in an ocean of development had long piqued the interest of biologists. Among them Miguel Ordeñana of the Natural History Museum of Los Angeles County. He was keen to find out if animals were traveling in and out of the park when the only safe routes to and fro were a few bridges and underpasses crossing the busy Hollywood Freeway. To shed some light on this, Miguel put motion-detecting cameras around the park and the routes over US 101 to get photos of passing animals. He wasn’t looking for mountain lions. “I was looking through the photos one afternoon, hoping to see a bobcat as that was the most rare, coolest thing at the time,” says Miguel. “I went through the photos and was really excited to see a bobcat in there. Soon after, the National Park Service trapped the then three-year-old animal so they could give him a radio collar that would let them track his movements. They christened him P-22. The park service has been following P-22 around Griffith Park ever since. One area of keen interest, given his proximity to the city, is his diet, so every week Laurel and Miguel have been heading into the park to check out locations where P-22 was hanging around for long periods to try to retrieve the remains of his kills. They invited me along on one of their trips. The goal? To visit three suspected P-22 kill sites. It’s a busy, hot Sunday morning when I join Laurel and Miguel at the park. The footpaths are filled with joggers and hikers, but we soon depart from the crowds to head into more rugged terrain. Mountain lions prefer to eat deer and elk. In the Santa Ana Mountains on the other side of L.A., mule deer make up 95 percent of what cougars eat. Coyotes account for another 4 percent of their diet. Mountain lions very rarely prey on pets, even when they are readily available. Nor do they often venture close to houses. So it’s something of a surprise when the third kill site of the day takes us out of Griffith Park and onto a road. After getting our bearings we figure out that the location is up the driveway of a large house. We head to the front door. But there’s no way to find out without going through the house, and that’s a problem. After all, what is the etiquette for turning up on someone’s doorstep, plastered in dirt and dripping with sweat, to ask if you can see their backyard because you think a lion killed something right by their house? After a short discussion, we decide to leave empty-handed. On the way back, Miguel tells me how he hopes P-22 will make people less frightened about cougars living near cities. “The media likes to make these mountain lions seem very dangerous, but having P-22 right in this very urban area in a small park is a testament to how, even in these urban areas, they are not going to be like a coyote and start asking for food,” he says. Adapted with permission from Feral Cities: Adventures with Animals in the Urban Jungle by Tristan Donovan, published by Chicago Review Press.